June 5, 2012 0 comments on "How to Make Raspberry Vinegar and Vinaigrette"
I have been having fun making homemade flavored vinegars. My blueberry vinegar was a big hit, so I decided to try making raspberry vinegar. It takes several weeks to make it, but it is very easy to make, and well worth the wait! Rinse and drain raspberries in a colander, removing any bad berries. Place rinsed raspberries into an empty pint or quart sized canning jar or other jar that has an airtight lid. Pour in the vinegar and cover with a lid. Place in your pantry cupboard for 2 weeks. The raspberries will slowly lose their color, turning white when the vinegar is done. After 2 weeks, remove the jar from the cupboard and then strain the vinegar through a fine mesh strainer. Discard the raspberries, pour the vinegar back into the jar, and the vinegar is ready to use. The original recipe says that you can store the vinegar in your pantry for up to 1 year, or you can store it in your refrigerator. Vinegar does not spoil if you leave it out of the refrigerator, so it can be left out for months without worrying it will go bad. I sent of my raspberry vinegar some to my sister and she said she ate it on her spinach salad without adding any oil to it. She loved it. If you want to add oil to it, to make an easy raspberry vinaigrette, just mix 1/4 c. raspberry vinegar with 3 tbsp. olive oil and salt and pepper to taste, and you have homemade raspberry vinaigrette. Flavored vinegars make great holiday gifts for friends and family and only require a few ingredients to make. Like this recipe? 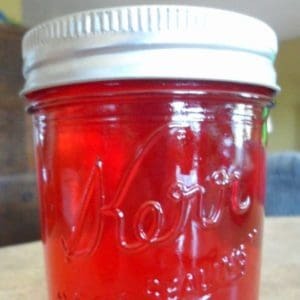 Try my recipe for canning raspberry jam from fresh raspberries.